Looking to hire a professional Tree Surgeon in South London? GraftinGardeners have expert tree surgeons in London and surrounding areas. We provide a comprehensive tree surgery service for clients and new customers all around London. If you require tree care or tree maintenance our arborists can help. Graftingardeners are highly skilled tree surgeons South London and surrounding areas. Our tree company has been providing top quality tree services for over 7 years and have the experience and expertise to complete any size job. We are arboricultural association approved contractors so you can feel confident when dealing with us. If you require tree surgery in South London, call us today and we can book you in for a free quotation at your earliest convenience. Need a dangerous or awkwardly placed tree removed from your property? Our tree surgeons have felled hundreds of dangerous and unwanted trees and can do the same for you. We have the expertise and skill set to safely fell any tree in any location, no matter how tight for space. We always bring trees down in a controlled manner for the safest possible fell. Contact us today for a free tree removal quote. Tree pruning is a delicate operation and you need to know what you’re doing as inexperienced pruning can lead to the death of a tree. The first thing we do is asses your trees by size, height, age, condition and a few other factors we consider. By our assessment we can then work out a suitable method of pruning. All cuts are made to the BS 3998 to leave your trees healthy and well-balanced all year round. Need an unwanted tree stump removed from your property? No problem! Our arborists are highly skilled at removing tree stumps and can take yours out regardless of size and location. We use powerful stump grinding equipment to remove tree stumps fast. We will remove your old tree stump and then fill the hole with mulch or a composition of your choosing so you can lay your new lawn or flower bed. Fallen trees are a pain in the back side because they usually cause lots of damage to your property. If you need a fallen tree removed fast then you came to the right place. Our emergency tree service can help you with fallen or dangerous trees, were open 24 hours a day, 365 days a year for all tree emergencies. We will come in and secure the area, remove the fallen trees and tidy the surrounding area so you can get things back to normal. Ivy causes all sorts of problems with housing structures like brickwork, woodwork and even roof tiles. Our ivy removal service is there to help you tackle pesky ivy from the source. We will remove ivy from the roots to ensure it doesn’t come back any time soon. If you would like to keep your ivy we also offer an ivy management service. We can cut trim and shape all types of ivy to keep that aesthetic feel to your home. Need help planting a large tree? Our team has strong workers and we can safely plant any large trees you may have. We have unrivalled experience in tree cultivation and tree management. We can source the best specimens and give you solid advice on planting locating and even advice on tree aftercare. Call us today for a free planting quote. GraftinGardeners have highly skilled hedge trimmers all over South London; we can cut, trim and shape just about any size hedge imaginable. We can reshape hedges and skilfully craft them into whatever style you like the choice is all yours. Contact us today for a free hedge trimming quote. 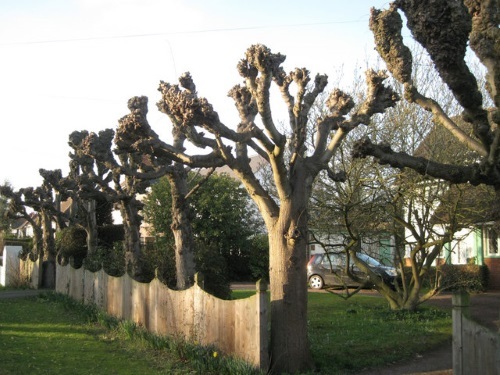 Tree pollarding should only be carried out on a selective number of tree species; it’s such a heavy form of pruning that most species won’t tolerate it. It’s a severe cut back of all limbs and branches and is used to control size. Willow and poplar trees are a few trees that can handle it but you will need to find out the correct method of pruning for your trees species. Contact us today and we can point you in the right direction.